Sagging Meniscus Press, 9781944697440, 210pp. Fiction. Sy Kirschbaum has spent almost twenty years in Prague translating legendary Czech dissident Jan Horak's samizdat masterpiece, Blue, Red, Gray. On the cusp of finishing, he is called back to his Maine hometown to see his troubled former lover, Ida Fields, now the wife of their childhood friend Gabe Slatky. But before he can see her, Sy must meet with Gabe for an evening at a local bar, an encounter that becomes a test of their old friendship and their dueling accounts of reality. In the conversation that follows, narratives of past and present--of art and life--interweave with perfect inevitability, yet with unpredictable, even shocking consequences, spiraling Sy and Gabe into confusion, doubt, and despair, without quite eroding, perhaps, the possibility of hope. 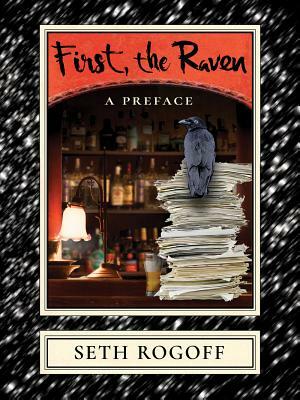 FIRST, THE RAVEN: A PREFACE is a quietly yet profoundly radical work, as ingenious as a print by Escher or a Mobius strip: the Reader must glide along its whole immaculately ramified length before realizing how deeply life, despite its unceasing, nearly flawless appearance of normalcy, is upside down.